The Magpul BEV Block is the second in Magpul’s two-deep lineup of armorer’s tools. 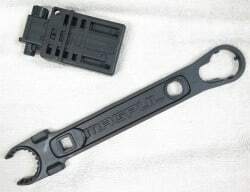 The other tool, Magpul’s Armorer’s Wrench, is an exceptionally well designed and executed tool that works equally well for the professional and the weekend armorer. The BEV Block, at over 11 ounces, is roughly 4.5” x 2.25” x 1.25” and the block weighs twice what a basic Delrin plastic mag well vise block does. 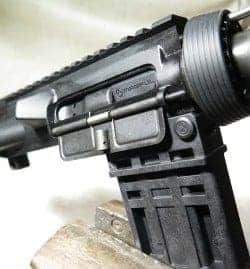 BEV stands for Barrel Extension Vise and is specifically designed for use with the AR15/M4 platform rifles and AR pistols of the .223/5.56 variety due to mag well and bolt size. 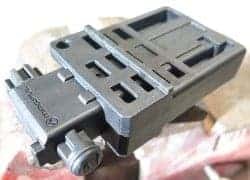 The multipurpose Magpul BEV Block can be used as a standard magazine well vise block, but its real advantage is as a upper receiver vise block. Regardless of which end is in the rifle, the other end must be secured into a bench vise for maximum stability. 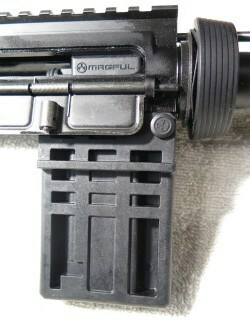 The Magpul BEV Block has a unique other end. And on that other end are two unique other ends. The Magpul BEV Block mimics the AR bolt on one end by meshing perfectly with the barrel extension splines. Opposite the barrel is another mating point where a bolt carrier sans the bolt, cam pin, firing pin, and firing pin retaining pin locks into the BEV Block with an O-ring as if grabbing the primer-end of a .5.56 cartridge. 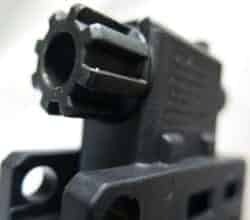 With the bolt carrier is inserted like normal with the charging handle locking it in place, an internal vise-like grip is achieved on the upper receiver. The combined fore and aft security of the Magpul BEV Block with the base seated tightly in a bench vise provides phenomenal upper receiver stability for serious work. But where the Magpul BEV Block really shines over more traditional clam-shell designs that grip the outside of a forged milspec upper receiver is that the Magpul BEV Block doesn’t get anywhere near the top rail meaning any optics or other rail accessories can remain untouched. And reading between the above lines, billet and other custom upper receiver millings and forgings usually prevent the clam-shells from working at all. For upper receiver work, the Magpul BEV Block locks into the forward takedown pin ports of the upper receiver using one of the three included plastic takedown pin drones. O-ring are used to hold the BCG onto the BEV Block and extras of those are included as well. Depending on the BCG, the fit can be quite tight and necessitate a bit of muscle to seat it, but it truly is a satisfying fit. Although the block part of the Magpul BEV Block is polymer, the splines that lock into the barrel extension are solid steel as is the bolt post. Using the Magpul BEV Block as a simple lower receiver receiver mag well vise block is top shelf as works as well or better than any other mag well vise block I’ve used. And don’t’ worry, the narrower profile of the upper receiver mating components keep them out of the vise jaws when inverted for lower receiver work. 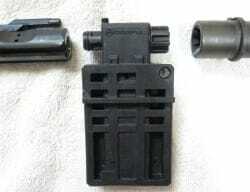 With an MSRP of $49.95 and a street price as low as forty bucks, the Magpul BEV Block sells for as much or not much more than a single function magwell vise block that works only for the lower receiver. If you’re shy about pulling apart your BCG for upper receiver work, the Magpul BEV Block may work fine with or without the added security of the bolt carrier. There will be more play and the upper receiver can tilt a bit, but as long as no receiver work pushes or pulls the barrel forward off the Magpul BEV Block barrel-only seating works fine. The Magpul BEV Block works great holding the upper receiver in one position, and the lower receiver either right side up or upside down. 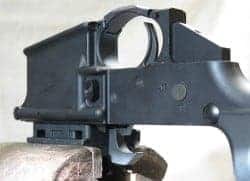 The upside down is for when you might be working on the grip and need to keep the safety selector detent and spring under the control of gravity. Or when playing around with the trigger guard. And of course, right side up allows full access to the lower receiver guts including trigger, safety, and buffer tube. In practice the Magpul BEV Block is essential for many tasks including torquing the barrel nut, snugging the castle nut, and loosening and re-tightening muzzle devices as well as some custom applications. 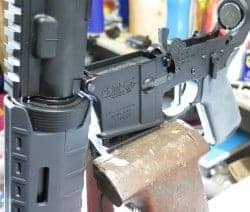 And it makes most other AR tool tasks easier and safer including trigger work, anything to do with the buffer tube, and installing or removing handguards whether free floating or delta ringed. It is hard to appreciate a design when the nuances of the mechanism can shoot springs across the room, or have detents slide out into oblivion when a receiver is rotated, or require more tools than a screwdriver. But for those of us who appreciate the AR15 and all its idiosyncrasies, the more we can tinker with our rifles, the better. So the value of a solid tool like the Magpul BEV Block is amplified through repeated use. Good tools encourage quality work. Great tools encourage confidence and understanding. And the Magpul BEV Block is a great tool.